...unless you're wearing this long chef apron over your clothes! Our cooking apron has been designed for professional and home use, and it covers your chest, waist and thigh area. So no matter what you're cooking and how you're cooking it, the grilling apron will keep your top and pants clean. Not Just A Plain Kitchen Apron! The minimalist BBQ apron for men and women has three pockets and practical double loop on its side. One of the pockets is on the chest, and you can store your phone, pen, recipe card, or little notebook in it. As for the double loop, you can use it to hang a kitchen towel and have it near you whenever you need to wipe your hands or remove a pan from the oven. Try The Grill Apron On And See What Comfort Really Feels Like! No matter your height, weight or body type, once you adjust the straps of the barbecue apron, it will fit you perfectly. In addition, the beard cooking apron is made with premium cotton, so it is lightweight, breathable, and incredibly durable. You won't have to replace this luxurious cook's apron anytime soon! For this reason, we offer you a 100% money back satisfaction guarantee. This means that if you're not happy with the quality, practicality and style of our professional kitchen apron with pockets, we will refund every last penny. So what are you waiting for? This is a completely risk free purchase, so don't hold back any longer! ✔️ KEEP YOUR CLOTHES CLEAN WHILE COOKING: If you want to keep your clothes clean every time you cook, this kitchen apron is for you! Generously sized 27" wide X 34" tall, it makes the perfect ADJUSTABLE up to 50" waist. The cooking apron will cover your chest, waist, and thigh area, so both your shirt and your pants will remain clean. This long apron is ideal for grilling, BBQs, home cooking, as well as for professional cooks, chefs and baristas at restaurants and bars. ✔️ PRACTICAL MULTIPOCKET DESIGN: The chef apron has two large pockets with flaps, and a chest pocket for your phone, pen and a small notebook. On one side, the BBQ apron also has a double towel loop, so that you can always have a towel within easy reach while you cook. Thanks to the smart design of this professional apron, meal preparation will be faster, since you will be able to carry your cooking tools in your pockets and multitask without problems! 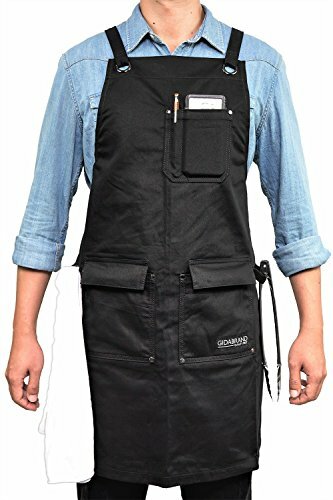 ✔️ STYLISH AND DURABLE GRILL APRON: Our chef's apron has been specially designed for daily use. In other words, the premium cotton material and double reinforced stitching ensure that this cook's apron is durable and built to last a lifetime! So use it daily, dirty it with your delicious cooking, and wash it as often as you have to. Even with constant use, the grilling apron will remain in excellent condition. ✔️ THE MOST COMFORTABLE CHEF APRON: When you're cooking, you need to move a lot around the kitchen, and this cotton apron is guaranteed to provide you with comfort and the freedom to make any movement without restraints. Thanks to the X-back design and the adjustable straps you will find the most comfortable fit, and the quick release buckles will help wear and remove the barbecue apron with ease. Finally, the lightweight apron is made of breathable cotton, so you won't get sweaty. ✔️ YOUR SATISFACTION IS GUARANTEED: This kitchen apron with pockets is under a 100% money back guarantee, making this a completely safe purchase. So get your very own beard cooking apron, wear it and start cooking! If there is something about it that you don't like, or if you're unsatisfied with its premium quality and practicality, we will give you your money back, no questions asked. If you have any questions about this product by GIDABRAND, contact us by completing and submitting the form below. If you are looking for a specif part number, please include it with your message.